Bentley’s tagline is “Advancing Infrastructure”. Would you like to elaborate this? 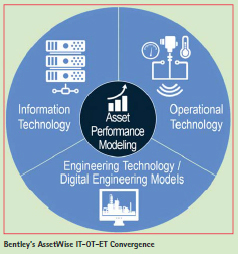 Bentley advances infrastructure by delivering solutions for the entire lifecycle of the infrastructure asset, tailored to the needs of the various professions – engineers, architects, planners, contractors, fabricators, IT managers, operators, and maintenance engineers – who will work on and work with that asset over its lifetime. Comprised of integrated applications and services built on an open platform, each solution is designed to ensure that information flows among workflow processes and project team members to enable interoperability and collaboration. How does Bentley plan on addressing ‘Aging Infrastructure’? Bentley is committed to providing solutions and services to meet the challenges associated with aging infrastructure. The degeneration of physical infrastructure manifests itself in differing asset types, such as broken water mains, collapsed bridges, decaying roads, and buildings in desperate need of renovation. At Bentley, we are equally committed to ensuring better project delivery on capital projects, as well as improving the performance of existing infrastructure. Implementing better project delivery processes is one way to manage aging infrastructure as it provides a platform for better understanding the infrastructure environment that relies on sustainability. For example, Bentley’s AssetWise software is specifi cally designed to improve asset performance by focusing on the health and longevity of the asset. AssetWise enables users to determine how asset performance can be enhanced, thus mitigating the effects of aging infrastructure. A good example would be a bridge that might require ongoing maintenance. Knowing the asset history and its health can provide options to better manage the life of the asset. When you use the term ‘Intelligent Infrastructure’ what are you trying to convey? Intelligent infrastructure can mean many different things. For Bentley, we are continuously striving to provide smarter solutions for better business outcomes. And, why shouldn’t infrastructure be intelligent? With the rise of big data and the Internet of Things, there is a real opportunity to harness the potential. At Bentley, we really see the value in engineering by providing software to interpret the data and offer smarter outcomes. An example of this could be in the water industry. With the large volume of sensors on a water network, there is a real opportunity to collect and analyse data related to a network to provide better insights. This would add a level of intelligence to the network and give water consumers a better experience. What challenges do you face in the developing world while encouraging the technological solutions? Emerging economies often have different requirements for technological adoption. Sometimes it can be limited funds, or language issues. We provide software in multiple languages and with much of our software, it is designed to provide an ROI. The reality is, we support nations that look to us to solve an engineering issue, and we’ve been doing this successfully for over 30 years. India has taken a major initiative in ‘smart cities’. What role Bentley can play? Smart cities are a huge topic in India. It seems all infrastructure projects fall under this umbrella. At Bentley, we see a huge potential in harnessing this and indeed contributing to what will be a very successful initiative. If we look at reality modelling for example, we can realise the potential for capturing and modelling an entire city. The concept of “reality modelling” is concerned with adding real-world imagery to infrastructure projects by capturing, processing, and reusing existing site data with 3D imaging and photogrammetric techniques. The world is moving away from 2D, and the benefits are bountiful. Today, with an application from Bentley called ContextCapture, even simple photographs can be turned into 3D models that are automatically generated to give virtual representations of existing infrastructure assets. This means in cities in India, the professional can capture all the assets within it. By automating the capture-to-process capability, enabled by computational power enhanced by the Cloud, modelling an entire city can now be done in an accurate and efficient manner. It also now supports hybrid inputs; this includes point-cloud data too, so digital photographs and point-cloud data can further enhance these models. The beauty behind these 3D models, is realized by the accuracy of the data and the precise geo-coordination gathered when combined and consumed in geospatial data. These semantically rich models are scalable and less intractable than a point cloud for example. These models can work seamlessly within engineering workflows and provide immersive designs with that real-world context to enliven designs beyond what we’re used to experiencing and will go a long way in helping India realize its smart cities objectives. What are the key factors you keep in mind while conceptualising technological solutions? First in our minds are the benefits the solution provides to the intended audience. Cutting-edge technology that doesn’t provide sufficient benefits is just “cool.” With that said, we do look for innovative, cutting-edge solutions to the problems we see in the market. 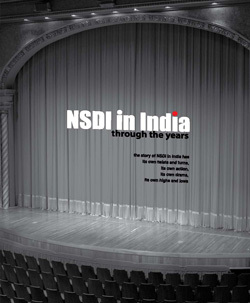 It is one way in which we differentiate our solutions from our competitors. What are the features of asset performance software? • Asset Lifecycle Information Management – allows owner-operators to understand the current state of their assets, the work that is planned for those assets, and what the future state of the assets are supposed to be. When we get to that future state, we want to be able to validate that it meets the performance and regulatory criteria. The supporting features for asset lifecycle information management are document and records management, workflows, and desktop, mobile, and Web publishing. • Asset Reliability – provides the features to monitor and track the condition and performance of their assets, develop, and execute advanced maintenance and reliability strategies, and plan and perform inspections using Web and mobile data collection features. • Compliance and Safety – provides the features to help ensure the assets, the use of the assets, and the processes around operating and maintaining the assets are all in compliance with the regulatory and safety criteria. • Operational Analytics – a lot of data is collected over the lifecycle of an infrastructure asset, and this data can be used to gain deeper understanding into the “as operated” performance of the asset, and what changes are required to make the asset perform more efficiently and with less risk. The features of operational analytics provide the analysis and insights into the operational data, and the modelling capabilities to support decision making. • Enterprise Interoperability – asset performance software is rarely deployed in isolation, but rather it is almost always integrated into an overall information system architecture in an organization that may include third-party financial software, materials management, workforce automation, and GIS. Asset performance software, therefore, must include a robust interoperability framework to integrate the workflows and information across these systems. This can be particularly interesting in cases of a hybrid cloud computing environment where some servers and services are provided in the public cloud and others in a private cloud or on premise. Would you like to share the success and prospects of hydrological modelling? Yes. I’ve been involved with hydraulic and hydrologic modelling for over 20 years. I have seen many great examples of success using these technologies, as well as the continuous transformation of these applications from offline master planning studies to real-time operational decision making. Bentley users have been successful in providing a continuous, 24×7 water supply to entire populations of cities that previously did not have one. And, they have been successful in using these tools to rebuild water supply systems after natural disasters. We have also seen successful implementation where there is an aging infrastructure crisis to identify the highest priorities for replacement and rehabilitation plans. I think prospects include more broad use of hydraulic and hydrologic modelling in real-time or near real-time decision making. As an inventor of several patented technologies, what gives you a sense of achievement and what leads to disappointment? While it is very satisfying to develop a new technology and release it to the market, the real sense of achievement accompanies the use of the technology to solve real-world problems. As an engineer, I like to see how other engineers are applying my work in innovative ways. Bentley’s annual Be Inspired Awards, for example, are a great way for me to see the fantastic achievements of the infrastructure community and know that my work and the work of my colleagues has really paid off. I think the most disappointing thing is when exactly the opposite occurs. In other words, when we’ve worked hard to solve a particular problem, and introduced a new capability or feature into the software, but few people are using it. We know that not every user will use every feature, but it’s still a disappointment, so we try to understand why it is not being used. It may be that users don’t know the feature exists, or maybe the user has alternative solutions, while not as efficient, that get the job done, and don’t feel it is worth switching workflows. Ultimately, we want everything we do to add value, and if something isn’t being used, it is not adding value. Which direction do you see the technology is moving in near future? Like many others, I see great opportunities in the continued use and growth of analytics and machine learning. Like I said earlier, a lot of data is collected over the lifecycle of an asset, and in today’s world of increasing sensors and the Internet of Things (IoT), the amount of data is growing rapidly. The potential for machines to help decision makers understand the data, the trends, and create actionable intelligence is exciting, and I think we’ll see some advances in this area soon. Explain the importance of ‘reality modelling’? Reality modelling is part of our strategy for advancing infrastructure. Not only are we focused on producing the best possible reality mesh output from photos and point clouds, but we are also looking at the downstream consumption of that data in mapping, design, construction, operations, and inspection. We are making those reality models available through different form factors, into all our applications from mobile, desktop, and the Internet. Please share some key features of your reality modelling software ContextCapture? ContextCapture is fundamentally capable of turning ordinary photos into 3D models consumable downstream supporting a range of applications in many industries. Although this is not unique, we are very proud of the quality of the output we are producing, our reality meshes are crisper and more detailed because our approach to mesh generation is unique. In addition to the quality of the output, ContextCapture Center will scale to any size and enable users to tackle the largest projects with the highest resolution of input images. With our latest release in November 2016, we now support combining terrestrial laser scanners with standard photos. Again, our unique approach to meshing is helping us leverage point clouds to augment the quality of the 3D reconstruction. Which are the key application areas of ContextCapture? Our users leverage the output of ContextCapture in different applications ranging from road and rails design and any other design that requires in-depth knowledge of the existing conditions, to inspection of bridges or communication towers and other assets, to industrial asset documentation in oil and gas or other asset classes where accurate as-built conditions are lacking. Would you like to share any example where drones are utilised? We have been working with a large utility company in France on their substation. They have flown a DJI drone and combined the aerial capture with ground images allowing them to capture many substations, to document the information and use it for brownfield design. We have also worked with large owner-operators in the oil and gas business that have used ContextCapture with drones to document their plant. In the transportation industry, multiple DOTs have leveraged UAVs and ContextCapture to survey a site prior to design. What solutions do you have in the field of surveying and mapping? Bentley ContextCapture and Bentley Descartes are applications that can be used by surveyors and mappers to document small or large areas and offer their services to a wider variety of new users. Explain ‘Reality Modelling goes mainstream›? For several decades, engineers have had to plan, design, and manage the newly engineered infrastructure in a void, since the “reality” of the existing landscape and the old infrastructure was not available at all or was only available schematically. With reality modelling, the entire 3D representation with all its details are available to them in their engineering applications, while they design the refurbishment or expansion or new infrastructure that they are planning. The availability of reality modelling information will subsequently find its way to many disciplines that want that realistic representation at their fingertips. What kind of technologies are used for reality modelling? The data capture sources can now be any method that captures either photos, or laser scan data, or a combination of the two. This can be aerial photography, terrestrial photography, from a UAV, from a smart phone, and from a variety of laser scanning devices. So, with advances in reality modelling come new ways to capture the data. On the photo capture side, we have seen the quality of images improve, as there are new laser scanning devices coming to the market. Would you like sharing some success stories of ‘reality modelling’? 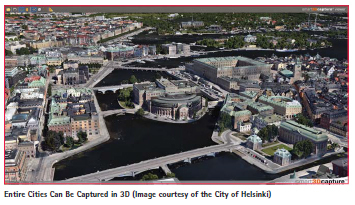 One of my favourite success stories is the city of Helsinki, which has used aerial photography to generate a 3D model of the entire city and its surroundings, and has made this data publicly available. The great vision here is that a) what they generate is shared back for public consumption and b) they proactively help other departments and organisations. How do you see the difference in the developed world versus the developing world? There is more information available in the developed world to combine with the 3D data and, hence, the chances of building a richer information system may appear to be higher. But, on the other hand, is there the possibility for the developing world to totally leap into the future by having aging infrastructure photographed and converted to a 3D model. This will bring them right up to date with the actual status of the infrastructure that is out there in the field. So, both the developed world and the developing world can benefit tremendously. How to make technologies viable to those users who may not fi nd it feasible due to financial constraints? The cost of capturing a 3D reality model is much lower because of this new technology than it is with older methods, such as surveying and reconstructing, or laser scanning. But the cost can be further controlled since handheld quality cameras or a quality camera on a drone is much more affordable now. For processing, we offer our users the ability to purchase licenses and do their own processing when they have continuous longer term projects, and the possibility to rent the software for shorter periods, or to process in the cloud, if they don’t have their own hardware infrastructure. This allows companies to find the best financial solution that suits their needs, based on their projects.